Shout, Sister, Shout! is the first biography of this trailblazing performer who influenced scores of popular musicians, from Elvis Presley and Little Richard to Eric Clapton and Bonnie Raitt. An African American guitar virtuoso, Tharpe defied categorization. Blues singer, gospel singer, folk artist, and rock-and-roller, she “went electric” in the late 1930s, amazing northern and southern, U.S. and international, and white and black audiences with her charisma and skill. Ambitious and relentlessly public, Tharpe even staged her own wedding as a gospel concert-in a stadium holding 20,000 people! Wald’s eye-opening biography, which draws on the memories of over 150 people who knew or worked with Tharpe, introduces us to this intriguing and forgotten musical heavyweight, forever altering our understanding of both women in rock and U.S. popular music. 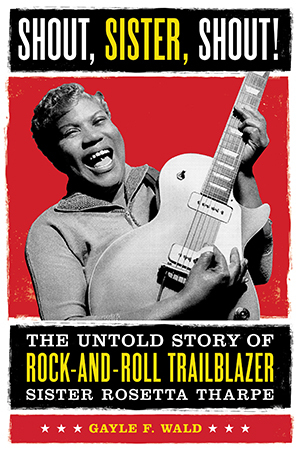 "Rosetta Tharpe's story, salvaged here by Wald, a professor of English at George Washington University, is very much a woman's story, refreshingly free of Svengalis and impresarios. Her picaresque journey from Pentecostal child prodigy in Cotton Plant, Ark., to preteen phenom on Chicago's church circuit to Cotton Club darling to one of gospel's first recording starts in constantly surprising."